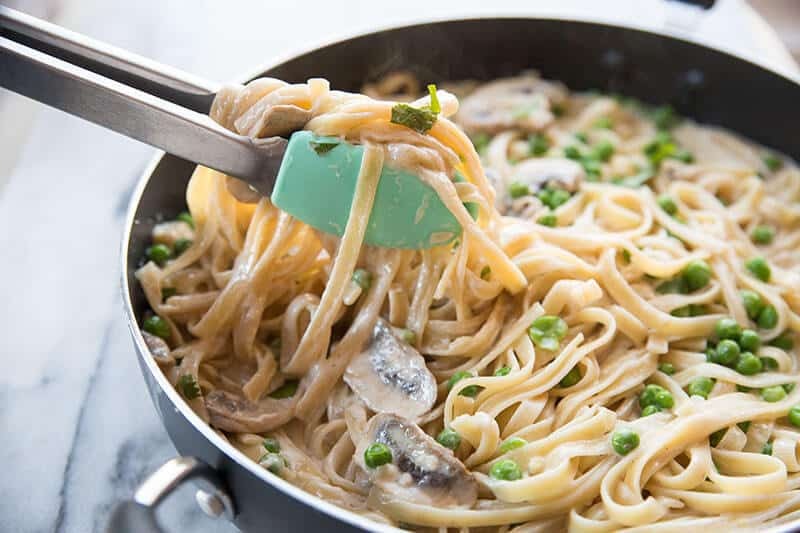 This decadent and delicious Creamy Garlic Alfredo Sauce Fettuccine Skillet always gets rave reviews from friends and family! It’s quick and easy to prepare and full of mouthwatering flavour! What more could you want? (well, aside from a personal chef to hand it to you already prepared!). The ingredients are super simple and the recipe is just as easy to follow. You’ll never visit the ready made sauce section in the grocery store again once you try this! In a large deep skillet on medium-high heat, melt the butter and fry the mushrooms in it until they are cooked and have released most of their moisture. Add in the garlic, fry until fragrant and browned for around 2 minutes. Add in the peas and warm up. Whisk in the whipping cream until combined. Stir in the Parmesan cheese, mixing it into the cream sauce until it melts into the sauce. Stir in the cooked fettuccine noodles and simmer until the noodles are hot. Use the salt and pepper to taste, then serve. How Should I Serve This Fettuccine Skillet? Since this takes only half an hour to prepare, it’s the perfect weeknight dinner. Just add a simple side salad and it’s ready to go! I sometimes like to add some shrimp (check out my Shrimp Alfredo recipe too!) and vegetables when serving to adults, but the kids love when I add some grilled chicken to this dish too. If you have any leftover sauce, try pouring it over some steamed veg for some lovely flavour. It also works as a super tasty dip or pizza topping option! Where Did This Delicious Alfredo Sauce Delight Come From?! 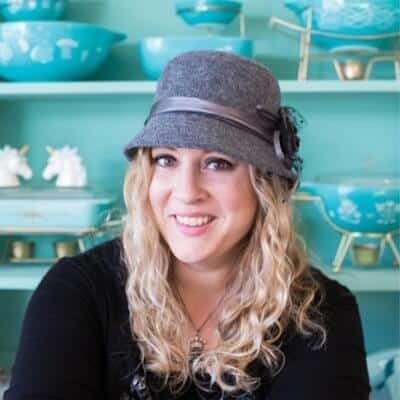 This Italian-American comfort food has a bit of a strange backstory! It was first created by Alfredo di Lelio in Rome in 1914, but with a very different recipe. The “Fettuccine Burro e Parmigiano” that Alfredo created for his wife, who was pregnant at the time (best husband EVER – right?! ), could easily be compared to cheesy buttered noodles! The thing is, he was such a good chef (being Italian!) that even his cheesy buttered noodles were unbelievably delicious and soon adopted by Americans as a staple comfort food. Except, they added cream to the mix! What Can I Substitute for Heavy Whipping Cream in Alfredo Sauce? 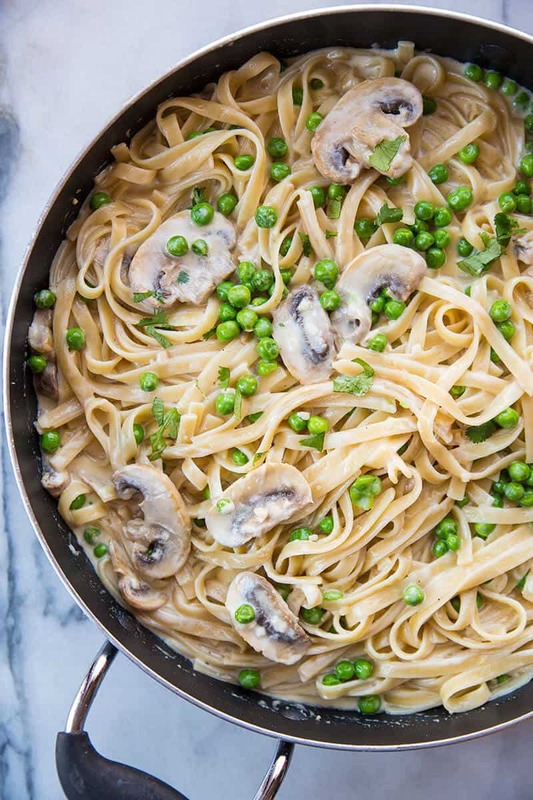 There are so many dishes you can cook up with Alfredo Sauce – the options are almost limitless! But this is definitely at the top of my list. 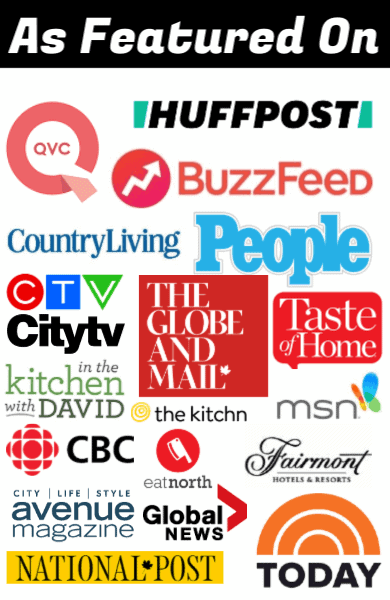 I’d love to know what your own favourite Alfredo Sauce dishes are, so don’t forget to leave a comment with your own tips and recipes! 5 Ingredient Cream Cheese Alfredo Sauce Recipe: warning, this might be the worst-for-your-health-ever Alfredo sauce out there. But it is DELICIOUS! Everything in moderation, right?! Shrimp Alfredo: this is a great way to satisfy a shrimp craving, and it’s so yum you might get the family on board too! Crock pot Chicken Alfredo Lasagna: a delectable chicken lasagna that the whole family will enjoy (except my son!). 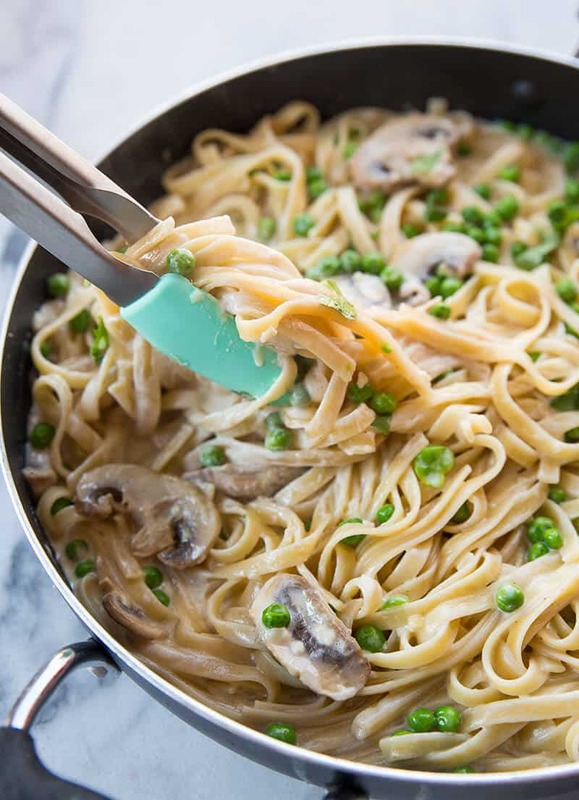 Creamy garlic Alfredo sauce is combined with fresh mushrooms, peas and fettuccine noodles to make the perfect easy skillet dinner for your family! In a large deep skillet on medium-high heat, melt the butter and fry the mushrooms in it until they are cooked and have released most of their moisture. Add in the garlic, fry until fragrant and browned, around 2 minutes, Add in the peas and warm up.